Now in the fifth year of their internationally acclaimed collaboration, cellist Yo-Yo Ma and the Silk Road Ensemble continue to explore the musical cultures that flourished along the Silk Road – the ancient trade route between China and the West – with their latest recording for Sony Classical, entitled Silk Road Journeys: Beyond the Horizon. The recording will be released just as the performers embark on a brief tour of major U.S. cities. Silk Road Journeys: Beyond the Horizon was released on Tuesday, April 5, 2005. 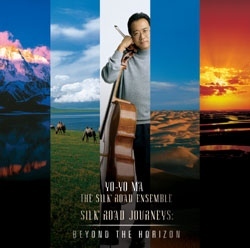 The music for Silk Road Journeys: Beyond the Horizon was created in the fall of 2004, to be heard on the soundtrack of a television series about the Silk Road created by the Japanese network NHK. To develop the repertoire, Ma and the musicians returned to the grounds of the Tanglewood Music Center in Lenox, Massachusetts, where they held their first musical workshops in 2000. The recording includes music by two of China's leading film composers – Zhao Jiping and Zhao Lin – as well as the works of such innovative members of the ensemble as the Iranian kamancheh virtuoso Kayhan Kalhor; Alim Qasimov, vocalist and master of the Azerbaijani mugham musical tradition; Indian tabla virtuoso Sandeep Das; and Wu Tong, who also plays the xun, a type of ocarina that is among the most ancient of Chinese instruments. "For me, the music on this album also crosses boundaries of time and space, revealing the unity among seemingly different traditions," Ma says. "The first part of the album begins with a work by Sandeep Das entitled 'Mohini' (Silk Road Journeys: Beyond the Horizon). The second part explores origins and rootedness, evoking the memory of the nomadic peoples who traveled and lived along the Silk Road. The final third of the album is revelatory, including the transcendent vocals of Alim Qasimov and the serene harmonies of Zhao Jiping's 'Sacred Cloud Music.'" Silk Road Journeys: Beyond the Horizon features 15 new works – one is an ensemble improvisation – that encompass the full scope of the Silk Road Project, founded in 1998 by Yo-Yo Ma, who is also its artistic director. The Silk Road is the name for the trade route that, for centuries, linked Europe and the Eastern world. Travel along the Silk Road resulted in a complex web of interconnections between cultures that affected not only formal aesthetic expression but folk expression as well in a vast array of cultures. During the course of the Silk Road Project, composers from Armenia, Azerbaijan, China, Iran, Japan, Kazakhstan, Korea, Mongolia, Tajikistan, Turkey and Uzbekistan have been invited to contribute music that evokes this intersection of cultures, and these works are sampled on the project's first recording, Silk Road Journeys: When Strangers Meet, released by Sony Classical in 2002. Yo-Yo Ma is an exclusive Sony Classical artist, and his most recent release is Yo-Yo Ma Plays Ennio Morricone, a collaboration with the renowned Italian film composer that includes new treatments of some of Morricone's most popular film scores. In 2004, Ma won his 15th Grammy for Obrigado Brazil, his best-selling Sony Classical release that celebrates the music of Brazil. The success of that recording and a subsequent international tour inspired a sequel disc, released earlier this year, entitled Yo-Yo Ma Obrigado Brazil Live in Concert, which went on to win a Latin Grammy. Ma also recently released Vivaldi's Cello, his first recording of the music of Baroque master Antonio Vivaldi, with Ton Koopman and the Amsterdam Baroque Orchestra. Silk Road Journeys: Beyond the Horizon, as well as Silk Road Journeys: When Strangers Meet and the Silk Road Project itself, are featured on Sony Classical's Web site at www.sonyclassical.com and on Yo-Yo Ma's artist domain at www.Yo-YoMa.com . More information on the Silk Road Project – including background on the performers, instruments, concert performances and workshops – can be found on the Silk Road Project Web site at www.silkroadproject.org .